Boro describes a genre of indigo dyed, hand sewn, Japanese historical textiles. Characteristic of Boro are the signs of wear and repair which emphasise their utilitarian, historical and social origins, a limited colour palette (resulting from political restriction on the use of colour dependent on class), restricted access to materials, and the need to maximise the life of the cloth for practical and economic reasons. In their current incarnation the narratives of these cloths have also been patinated by a further layer of appropriation and designation as ‘works of art’. This latest incarnation is achieved through the visual language of art by mounting on stretcher frames covered with canvas and wall hanging. 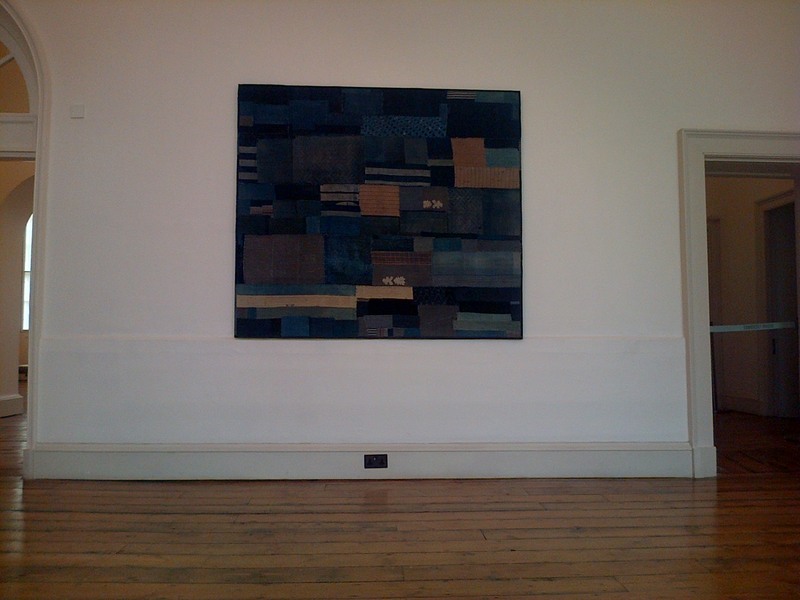 Visually Boro cloths have been compared to 20th century art’s abstract and assemblage movements. It is these visual similarities, it seems, which are sufficient to designate these textiles art and this is where I have problems with them. For me they are not art. They are appropriated, fetishised textiles. There is nothing to indicate that the makers intended to articulate or communicate with others through them and the accompanying catalogue does nothing to dispel this belief, recording only the social and anthropological context of their existence. They must remain, for me at least, decoration and in the more formal context of the debates of textile art contribute little. However, having dumped my more rational, academic response to the exhibited textiles, they are nonetheless undoubtedly beautiful and highly desirable. They have an air of calm and contemplation. The worn surface invites conjecture and a projection of (romanticised) narrative. The subtle variety of tones, textures, woven patterning, resist patterning and accompanying hand stitching, sometimes erratically dispersed across the cloth, sometimes more measured ensures these textiles are visually interesting. Despite their age they have a timeless quality attributable, in my opinion to the use of indigo dye and visual similarity to the ubiquitous denim. It is impossible to know if the composition of these cloths was ever considered by the makers or whether the juxtaposition of the pieces was pure chance. For me they indicate something of what I consider to be an innate human characteristic to decorate and to please the eye. However, in their current incarnation the influence of the collector/curator to select, collect and appropriate is also a considerable influence on their aesthetic quality. Some of the exhibits retained their garment structure which set up a tension with the more western aesthetic used in the majority of the works. I am uncertain as to whether the mounted, wall hung works are cropped and cut from larger pieces to enhance and therefore manage their appeal. Undisputed, in my opinion, is Boro cloths’ ability to make a statement in a certain type of domestic setting. This is reinforced by the display at Somerset House in a number of ‘domestic scaled’ (just) spaces on off white walls against varnished floor boards and provocatively suspended above generously proportioned fire surrounds. There was a huge component of aspirational life-style in this exhibition, it is a selling exhibition after all, which is strangely at odds with a textile born out of hardship and poverty! This entry was posted in Exhibitions and tagged Textiles. Bookmark the permalink.